The Global Genes Project exists to unify, support, build awareness and raise much needed funds for those affected by rare disease. "Rare Disease affects over 250 million people worldwide, and the largest percentage are children. There are over 7,000 rare diseases that have been identified all with very unique needs, but many with little to no support. Lori Anderson, who authors "Pretty Things," took the initiative to organize the beading community to create bracelets for the 7000 Bracelets of Hope campaign. I have made this bracelet, on behalf of Elysian Studios, to support this campaign. I hope it shares love and support with a family that is caring for a child with a rare disease, and will be praying for it's recipient. Handmade Denim and Blue Satin cord: Represents the unifying symbol of denim that is a trademark of the Global Genes Project. This denim was up-cycled from a pair of my son's jeans. This fabric has seen many active, play-filled days, and I want the bracelet to carry a prayer with it for that joy. Copper chain and findings: Copper has a history of being known for its healing properties. Not only is this metal soothing to look at, but it is said to have medicinal and healing effects on one who wears it. 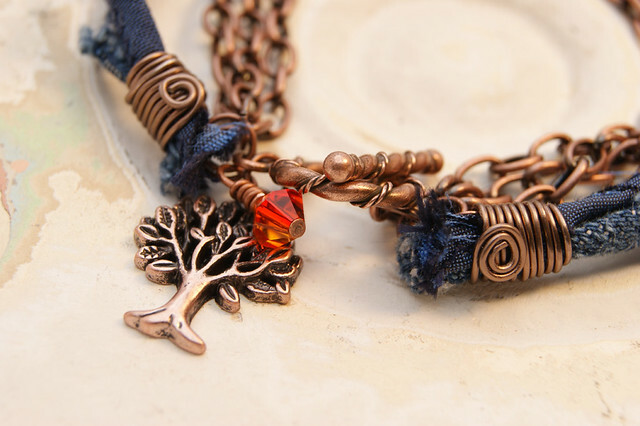 Copper chain, hand-coiled and spiraled wire, clasp and charms have been included in this design. Watercolor Patchwork: A small circle of an original painting from my watercolor journal has been snipped and covered with resin in a copper bezel for the focal of the bracelet. The painting was a simple patchwork of colors. This represents the many people involved in the rare disease community. Patients, families, doctors,research institutes, and pharmaceutical companies all play essential roles in discovering treatment and cures. Heart (Love): Love is an essential component to the cure for any disease. Knowing you are a part of a community, prayed for and loved is vital to the well-being of everyone, especially those facing the difficulties of illness. Feather (Virtue): Courage is a virtue, and one that is greatly needed by those suffering from an illness. I pray that the children, families, doctors and researchers have great courage to stand together and combat these diseases. Tree of Life (Family Tree): More than anything, a family unit is critical for surviving the difficulties of a rare disease. It is my prayer for the recipient of this bracelet that they have a strong family of loved ones, doctors and friends to assist them through the challenges of illness. 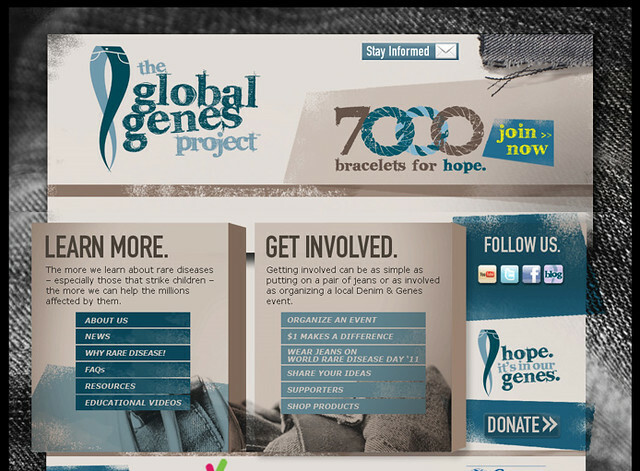 I have signed up, and will be mailing this bracelet off to a very deserving member of the Global Genes Project family! Wanna see something cool? Check out all of the other artisans participating in 7000 Bracelets! fabulous!! I loved reading the symbolism behind your design and I'm certain the family receiving it will also. fantastic job!! You put a lot of thought into this bracelet. I really enjoyed reading about the symbolism of the charms. I am sure this will become the recipients "go to" bracelet. Beautiful bracelet! And yes you put a lot of thought into each and every part of it. Love it! So awesome - all your thought - every little detail - it all will mean so much to the family that will receives it - beautiful piece! 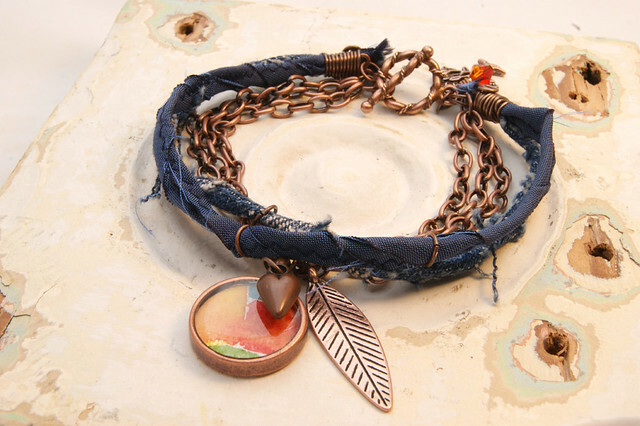 Love the use of actual denim in your bracelet. Really cool! I'm sure the time and thought you put into this piece will be obvious to the family. . .and your hope for them will be appreciated greatly. The only thing more beautiful than your bracelet, is the love you put into creating it ! AWESOME in the true sense of the word!!! Really pretty, very unique, and lots of thought went into this! Wow, this is absolutely stunning! I love the meaning behind the design, and how you've worked actual denim into your bracelet. What a lovely symbol of hope and love! The symbolism in your beautiful bracelet is amazing. Fabulous bracelet and I love the different elements and meaning you have incorporated into this gorgeous bracelet! Love the bracelet and all the thoughtful things put into it. It has a lot of power within. Love the meanings and the denim and fiber you used. I am in love with blue and copper as a pair too. Nice bracelet- takes casual to a new level!! Thank you all for your kind comments! I greatly appreciate them! Not only your bracelet is beautiful but when I read the meaning of all the elements... is wonderful. Great job! What a thoughtful bracelet - Nice! You made a wonderful bracelet! Who would have thought to actually incorporate denim! Seriously - I Love it - really creative and very cool. I just love what you created! Your bracelet is so lovely and meaningful. I love the charm that you made from your watercolor journal. The symbolism is beautiful. What a beautiful and thoughtful design. I love how everything flows together quite nicely and the meaning behind your design...awesome! Someone will really enjoy your bracelet! I just love the way you incorporated all the different design elements into this stunning creation. Someone is going to be very, very happy!! I love every little thing about this piece but the handmade upcycled denim is outta this world awesome. You rock! Oh Erin, Your bracelet is so fantastic. I am so happy I found it. I love the blue jeans and copper together. They are perfect. Thanks for visiting my blog with such kind words. Such a beautiful bracelet friend! Thank you for sharing your creativity & hope for this very worthy cause!! What a wonderful design! I love all of the elements together, and the meaning behind each. Fabulous job! beautiful and sooo full of meaning. Love all the thought and care you put into this bracelet. The design is wonderful. I love the copper wraps, and the resin pendant. I love all the materials you combined - beautiful and unique! Absolutly love this one! Great design! Lovely! I love the use of the fabic, really awesome! Wow- I am so thankful for all of your kind comments! I am still enjoying the hop myself, and amazed at all of the talented designers! Fantastic design, Erin! I love the combination of denim and copper and the symbolism for this cause. Thanks for sharing this story! This is so meaningful and beautiful! Very beautiful! Oh,Erin! This is just fantastic. I love the rustic and playful quality and the mix of textures. But then to read the thought behind it all...that is really priceless! Enjoy the day! I just love this! That bracelet is amazing!!! So gorgeous! Beautiful bracelet (one of my favs so far)...i love all the thoughtfullness and care you put into it, someone will be very happy! wow, I like the thought behind all the elements that you put into the bracelet. that is really gorgeous and heartfelt. well done! 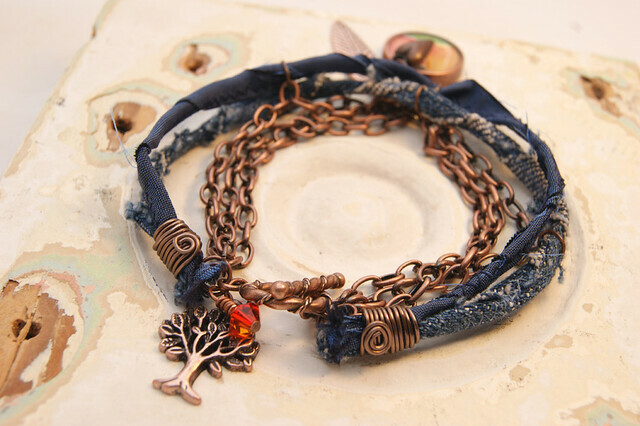 Erin, I'm a fiber freak, and I just love how you've incorporated the denim into your bracelet. Made with love, that's for sure! I love it! I could wear it all day ... and all night long! Love the rustic, blue jeans look. It is overflowing with love! Wow tu brazalete esta hermoso y sobre todo hecho con mucho entusiasmo, esmero y dedicación. Casa componente tiene un significado especial! Hermosa idea! Your bracelets are wonderful, especially the "tree of life" one! I shared them on Pinterest :) We are also doing our part to help The Global Genes Project by donating a portion of our proceeds this month! Visit Roozt.com or mydenimdevil.com to help us do so!